Our Greatest Assets: Jennifer Biese – Dyslexia Reading Connection, Inc. Please meet Jenn Biese. She has been with the DRC since the fall of 2015. Jenn has a stable background in special needs and child development. Jenn works in the autism program at Huntley Elementary School in Appleton, WI. Previously, Jenn was an early childhood development teacher. 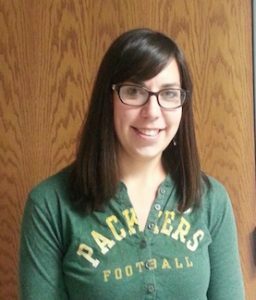 Jenn earned her Bachelor of Science in Human Development from theUniversity of Wisconsin – Green Bay. I enjoy seeing the students succeed and become better readers and spellers. Working with the children to gain skills and reading confidence is so rewarding. I enjoy working with parents to help their children succeed and the families here are so great to work with. My co-workers and tutors are really nice, caring people and management is super. Can you highlight an experience at DRC that brought you reward (i.e., graduate, an ‘ah-ha’ moment, a compliment from student or parent)? Personal information (married, kids, pets, hobbies)? I am married to a wonderful man, Brett. I love the outdoors, I enjoy backpacking, kayaking, camping, and snowshoeing. I also enjoy home improvement and we are currently working on making some updates to our home. Favorite Quote? Who inspires/inspired you? I am SO proud of the wonderful woman you have become! I am honored to have had you in my preschool class. Keep up the great work.